Welcome to LureMaking.com, Real Pro's SportFishing's web site. Real Pro's SportFishing is Canada's leading supplier of lure making parts, components and supplies, for the manufacturer, tackle shop and angler. Real Pro's SportFishing has been shipping tackle components daily to lure makers across Canada, the USA and the world for over twenty years, right to your door from our warehouse in Ontario, Canada. We are entering our twenty sixth year of operation in Grey County. We are absolutely confident that we have the widest selection of tackle components, lure making parts, and lure making tools available in Canada. Our staff is focused on solving all of your lure making problems, whether it is helping you find that hard to get lure making part for your project, or giving you suggestions on how to assemble, paint or use them. 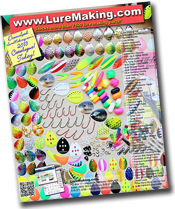 We have built our business on having the lure making parts and tackle components you need in-stock and ready to ship to your door no mater where you live.. See the links to our available on-line catalogues below. We do not offer a print catalogue. All orders and mail correspondence should be sent to this address along with all returns sent via Canada Post, United States Parcel Service, and International mail. All shipments and returns shipped via United Parcel Service, Purolator Courier, Federal Express, CanPar and Loomis Courier.